A lot of railway poetry and song must be written in a state of meditative repose. That would explain why even Thomas Hardy’s “The Missed Train”, Flanders’ and Swann’s “The Slow Train” and Jean Sprackland’s “The Stopped Train” prompt not the usual rage and frustration but – respectively – metaphysical stirrings, elegiac whimsy and brooding self-analysis. Not for the poet the petty complaints and confined ambitions of the commuter. For WH Auden, in “Gare du Midi”, a “nondescript express” seems to be freighting world history into the heart of a city. Robert Johnson laments his lonesomeness as a dwindling train carries away a lady in “Love in Vain Blues”. Ezra Pound, finding himself “In a Station of the Metro”, sees not a crowd of faces but “Petals on a wet, black bough’. 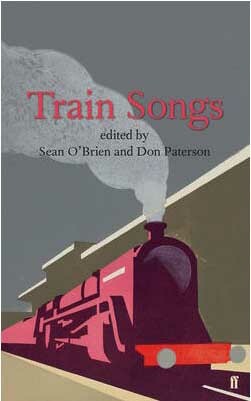 All of these are included in this rich and varied compilation of verse and lyric, which spans the Atlantic and more than 150 years of “train songs”. Some of the inclusions are compulsory: Philip Larkin’s “Whitsun Weddings”, for instance, and Auden’s “Night Mail”. But the editors have journeyed wide around the back catalogue to include anonymous folk songs, standards from Stateside not known elsewhere and plenty of contemporary verse. Even the two poems by John Betjeman – who was the quasi-official bard of British Rail long before he became Poet Laureate – are not obvious Metro-land classics. Is it the iambs and anapests of the train that beguile poets? Is it the theological potency of the railway metaphor (trains, like life, are outside our control, go through dark tunnels, stop in the middle of nowhere, and get to their destination/destiny whether we like it or not)? Is it because trains haunt our nightly dreams? Wordsworth, the earliest poet included here, was vehemently opposed to the railways. “Is there no nook of English ground secure/From rash assault?” he asks in “On the Projected Kendal and Windermere Railway”. Anti-HS2 campaigners will no doubt share his disdain. But our railway lines have opened up deep cuttings in human life and, in poetry at least, have taken us on to new places and new sensations, as well as back to ancient truths. Train Songs is a choice sampler of what some of our more inspired fellow passengers have seen and felt while standing on platforms and sitting quietly beside windows; I can think of few better books to take on a journey prone to delays and dull vistas.